Patterned steels have been used in knife blades since the days before The Roman Empire. The term “Damascus” originated in England during the times of The Crusades to describe the patterned blades made under methods shrouded in secrecy by Middle Eastern swordsmiths. Our material is manufactured using an award-winning and innovative process of combining two constituent, exceptionally pure and hard steel grades to produce a stainless “Damasteel”. This produces a material not only of truly beautiful and unique appearance, but also one of extraordinary edge retention and corrosion resistance, and a hardness of 58-64 Rockwell C.
Each piece is carefully selected so that the characteristic “grain” of the material is revealed and emphasised by hand grinding, polishing and etching processes; the latter a method we have specially developed to produce a knife of breathtaking beauty. No two knives will be the same. This traditional process involves masking areas of the blade material. Acids are applied to the uncovered areas which eat away at the exposed metal to create the required mark. The profile of the blade is applied by a craftsman by hand. We use a traditional "saddle grinder" for our Bowie and Commando Knife blades. 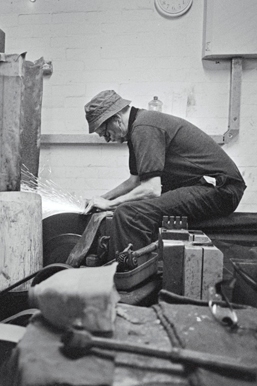 A saddle grinder being a large grinding wheel at which the craftsman works sat astride a raised seat rather like a saddle. It takes many years for a craftsman to learn the art of grinding a knife blade by hand. 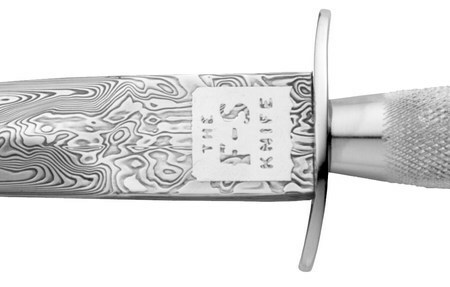 Sometimes known as German Silver, Nickel Silver was used for guards, liners and other handle pieces by the great Sheffield Knife makers of the 1800's. We are using this authentic material across the Sheffield Collectable Knives range. 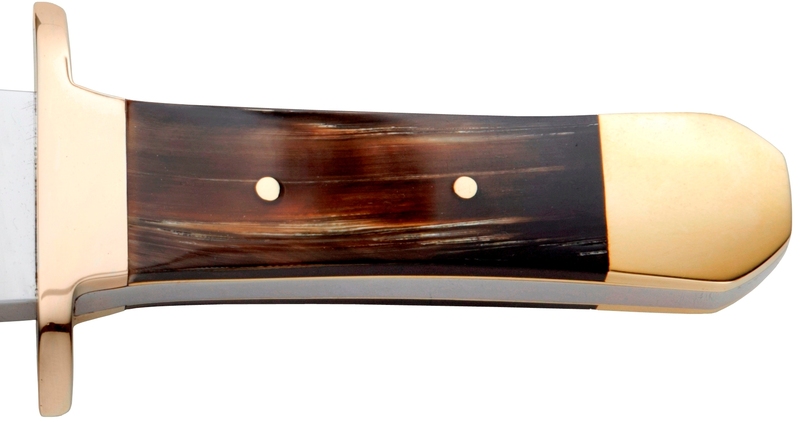 The flat, un-sharpened area of the blade just above the guard often used to apply the maker's mark, or in the case of the above image of the First Pattern Commando Knife in Damascus Steel, "The F-S Knife". The metal blades are struck with a hardened metal marking die. This traditional process is used for marking blade ricassos and in the case of some I*XL Bowie Knives, the flat area to the top of the blade are marked with famous Wostenholm stamps from the archives.